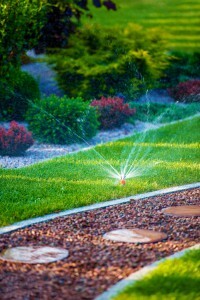 We all know that irrigating your lawn is important to maintaining a healthy lawn in the hot, arid summer months. There are many different options for watering though. Of course, you can install a cheap sprinkler from the local hardware store. Another option is to invest in a quality drips system, or you can simply water the old fashion way. The biggest advantage to a sprinkler system is that it can cover large areas with limited effort on your part. If it’s automatic you won’t even need to open the valve or close it when the watering session is done. However, with automatic systems make sure to monitor rainfall levels so as not to overdo it. You will need to adjust the schedule so that your lawn doesn’t get washed out. Drip systems are excellent for small lawns, small areas of plants such as a garden, or individual plants. These systems are good for supplying about 1 to 4 gallons of water per hour directly on the soil. Because dripping is less violent than water shot out of a sprinkler and rain water, it will cause less damage to mulch, will soak through it better and will lose less in evaporation. This is a great system as long as your needs are not too expansive. Watering by hand is one of the best ways to water your lawn or plants because it is probably the cheapest. Although you can use the old fashion watering bucket, it’s a good idea to control the water flow with a nozzle. Other than the simplicity and low costs, another great advantage of watering by hand is that you can easily control how much water you are using. When watering by hand, make sure that water is not accumulating above the surface of the ground. If it is, move on to a different spot. If you are watering plants, aim for the roots, not the leaves, this will allow the water to soak in more easily. No matter what irrigation method you choose, the whole idea is to get the right amount of water. Too little and your vegetation doesn’t have enough to survive the heat, too much and it will wash away precious top soil, erode root systems and waste water. Check when watering to see if the soil is moist 6 or more inches beneath the surface. If you are enthusiastic about your lawn and are looking for someone who shares that enthusiasm, you’ve come to the right place. At Greener Horizon in Middleboro MA, we are not only lawn experts, we are lawn lovers. If you need help deciding which irrigation method is right for your needs, be sure to contact our expert team. We will walk you through the process, answer any other landscaping questions you may have, and schedule a complementary consultation.